Chutneys are important not only for snacks but they are an integral part of the main course too. Chutney is essentially an Indian condiment. Chutneys are made both from vegetable and fruit. They are generally spicy they can also be made sweet. In their absence an Indian meal remains incomplete. I give you here, some good, tasty chutney recipes. Avocado, a tropical fruit, is a complete food with many essential nutrients like proteins, vitamin E, C, B, folic acid, iron, minerals, antioxidants and fiber. It has no cholesterol and is sodium free. Avocado shake with milk and sugar is a famous drink. Being highly nutrient, it can be used to make salads, shakes, sandwitches etc. Since the fruit has a neutral taste, it easily blends with the things that are added to it. This chutney can be had as a dip for chips or used to make sandwitches. 1. Dry roast the 2tbsp of coconut in a dry skillet on medium heat. Stir constantly until uniformly golden brown. 2. In a bowl, mash avocado. Add 1/4 cup of coconut, tomato and lime juice. Mix well. 3. In a skillet, dry roast garlic cloves with skin over medium heat until skins start to brown. Remove skin and place in a blender. Add shallots to the blender along with salt and process to a paste. 4. Add the garlic paste to the avocado mixture. Also, add cilantro and chilies. Stir well to mix. 5. Garnish with roasted coconut and serve with dosas or puris, Chapatis. [Serves: Makes 3 cups-Cups Size:143gms. Brinjal Kotsu is the best accompaniment for the Ven Pongal recipe. 1. Cut brinjals into big pieces and cook till soft. 2. Grind together coconut, tamarind and cooked brinjal to form smooth paste. 3. Heat oil in a kadai and add mustard. 4. When it pops up, add asafoetida and urad dal and fry until golden brown. 5. Add green chillies, curry leaves and onion. Fry it for five minutes. 6. Now mix the brinjal paste, salt, turmeric powder and little water. 7. Reduce the heat and keep it on fire for two to three minutes. 8. Kotsu is ready to serve. This exotic sweet and sour chutney is a delicious condiment. This chutney can be called the ketchup of the east! 1.Break the tamarind into small pieces and soak in hot boiling water for one hour. 2.Mash it into a pulp and strain pressing the tamarind into the strainer so that all the pulp comes out. 3.Add sugar to the pulp mix well. 4.Add the remaining ingredients. Mix again well and taste. Add more sugar, salt or pepper as needed. 5.Chutney can be refrigerated for two to three months. 1.Tamarind chutney is delicious with samosas, pakoras, drizzled over dahi vadas, bhel poori, or any kind of chat. 2.This is also delicious as a dipping sauce for French fries, as a spread over crackers. 1.To use as a dip, thicker chutney is ideal. To use as a topping, add water to make the chutney thinner. 2.Add water and ice cubes to serve as a cool spicy drink. 3.Add equal parts yogurt and chutney to make a dipping sauce. 4.Try drizzling over rice to add a unique flavor to plain rice. 1. Take a pan and heat with 1 tsp of oil. 2. Add the channa dal, green chillies and ginger. 3. Fry till they turn into golden yellow colour. 6. Add the fried ingredients, coconut pieces and salt in a mixer grinder. 7. Grind to a fine paste. 8. Transfer into serving bowl. 9. In the same pan add 1 tsp of oil and heat. 10.Add mustard seeds and urad dal. 11.When they start to crackle add curry leaves. 12.Add this to the chutney and mix well and adjust salt. 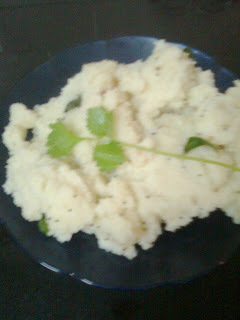 13.Serve with idly, dosa, upma, Ven-Pongal etc. Coriander chutney is an essential condiment with many of the snacks. 1. In a pan, heat oil and fry green chilies and take it out. 2. Add coriander leaves and tomato in the pan and fry until they turn soft. 3. Now grind coriander leaves and tomato with tamarind and salt. 4. Heat oil in a pan and fry all the seasoning ingredients. 5. As the mustard seeds starts to splutter, add this to the grinded coriander. 6. Coriander chutney is ready. *small lemon sized tamarind (soaked in warm water for 10 min. 1 Heat oil in a vessel, add the garlic and dry red chillis and stir fry for a few seconds. 2. Add the sliced onions and saute further for 2-3 mts on medium heat. Turn of heat and cool. 3. Grind the roasted peanuts, tamarind, sauteed onions and garlic along with salt and half a cup of water. 4. Heat oil in a pan for seasoning. Once hot, add the mustard seeds and once they splutter, add the split gram dal and let it turn golden brown. 5. Add the curry leaves and turn off heat. 6. Pour over chutney and serve with idlis or dosas. Coconut Chutney is a breakfast companion in South India, used as an accompaniment to almost all the breakfast items. 1. Shred the coconut into small pieces. 2. Fry the red chillies in a small pan. 3. Grind red chillies, coconut, tamarind and salt. Add minimum water. 4. Heat oil in a small pan. Add urad dal, chenna dal, mustard seeds, jeera, red chillies, hing and curry leaves. 5. Add the seasoning to the coconut chutney after mustard seeds start spluttering. 6. Coconut Chutney is ready. Cooking Time: 5 to 10 min. Onion Chutney is a tangy South Indian recipe, very relishing indeed. 3. Fry dal and red pepper till roasted. 4. Fry onion pieces till they are wilted. 5. Grind dal, onions, tamarind paste and salt to make a paste. 6. Serve it with Roti, Chapati, Upma, Puris etc.. This Chutney/Thuvayal is a fine, tasty accompaniment for Idlis, Dosa, Pongal varieties. 1. Heat little oil in a pan, roast the urad dal and grated coconut till a nice aroma come. Keep it aside. 2. Next add zucchini pieces and green chillies to the same pan and fry till it becomes tender. 3. Add the garlic, tamarind, Asaefoetida, cumin seeds and cilantro and saute for few minutes. 4. Gind all the above ingrediants along with the roasted dal and grated coconut in a blender. Grind it to a fine paste with little water. 5. Heat oil in a pan, splutter the mustard seeds, curry leaves and dry red chilly. 6. Add it to the ground mixture. Serve with plain white rice or idlis. This chutney is very tasty and it can be served with idli , dosa , vada, chapati and other tiffin varieties. *Red chilli powder - 1/2 tsp. *Blackgram dhal - 1/2 tsp. 1. Grind together tomatoes, onion, green chillies and jaggery to a smooth paste. 2. Heat a little oil. Fry mustard seeds, curry leaves and blackgram dhal. 3. Add to it the paste, chilly powder and salt. 4. Stir and let it simmer well. In a few minutes, the gravy will get thickned and leave the side. 5. Tomato chutney is ready to serve. *Sambar powder - 1/2 tsp. *Black gram dhal - 1/2 tsp. 1. Chop onion, tomatoes and green chillies. 2. In a frying pan, fry mustard, blackgram dhal. 3. Add chopped onion, tomatoes and chillies and stir well. 4. Add salt, sambar powder [or chilli powder]. 5. Let it simmer for 5-10 minutes until the gravy gets thickened. 6. Remove from the fire. Garnish with curry and coriander leaves. 7. Tomato chutney is ready and can be served with Idli, Dosa, Puris, Chapatis etc. My mother is known for her expertise in preparing the best of pickles. There are two types of tomato pickle my mother usually prepares, based on availability of fresh tomatoes, time and a good amount of sunshine. The sun dried version is labor intensive but totally worth the effort and time. Having said that, the other version she prepares is an instant tomato pickle that tastes equally good. It’s full flavored, well balanced, a little spicy with a superb garlicy tang and not to mention - a beautiful vibrant shade of red. This tangy and spicy pickle, so full fo flavour, works good with idlis, dosas and rice. One can also combine a tablespoon of tomato pickle in a cup of thick yogurt and serve with hot aloo parathas. Remember to use fresh, ripe and firm tomatoes for this pickle. 15 cloves garlic, sllightly crushed. 1 Heat oil in a heavy bottomed vessel, add the sliced tomatoes and cook on high heat for 5 mts. Reduce heat to medium high and continue to cook till the oil separates and the tomatoes turn mushy. 2 Towards the end of the cooking process as the oil seperates, reduce heat and keep stirring till the oil separates completely (the tomatoes could take a good 45 mts to an hour to cook). Turn off heat, add the tamarind and place lid. The tamarind will soften with the heat of the cooked tomatoes. Cool completely. 3 Once cool, add salt and grind the cooked tomatoes along with tamarind to a paste. Remove onto a vessel. Add chilli pwd and methi pwd. Combine. 3 In a pan, add 2 tbsps oil, add mustards seeds, methi seeds and fry till the mustard splutters and the methi turns red. Add the dry red chillis, curry leaves and saute for a few seconds and turn off heat. Add the crushed garlic and leave aside the tempering for 4-5 mts. 4 Once cool, add this tempering along with oil to the tomato paste. Combine well. Cool and store in an airtight bottle. Refrigerate. [ Serves: According to consumption. Chili pickle is a great way to spice up your food. Those who prefer mild levels of spicing might find this too hot. 1.Wash and wipe dry the green chilies. Make a vertical slit in the center of each chili. 2.Take coriander, fennel, and fenugreek seeds and grind them coarsely. Heat the oil and mix all the dry ingredients together, add vinegar and mix. 3.Fill the peppers with spice mix. Keep them in a glass jar and keep the jar in the sun for a day. 4.Chili pickle can be refrigerated for about a month. [ Serves: According to comsumption/shelf life. Though Avakaa is the most beloved mango pickle to the people of Andhra, there is also another variety in mango pickle called the sweet mango pickle. My mother learned this tasty pickle from her neighbour from Andhra. This pickle involves a lot of labour and time and the finished product is nodoubt delicious for the entire family! A sweet mango pickle with grated/sliced mango needs to be refrigerated. Dried mango slices, chilli powder, methi powder and jaggery are the ingredients which go into its making. For this recipe,there no fixed measurement of ingredients. If the mangoes are more sour, we just need to increase use of jaggery and vice versa. Makes a great accompaniment to curd rice and tiffins like upma. Very tasty to go with Curd Rice! I really love this recipe of my mothers'!! 1. Combine turmeric powder and two tbsps salt with the mango slices, cover with lid and leave overnight. 2. Next day, strain the water and sun- dry the mango slices for three days. 3. On the fourth day, prepare the grated pickle. 4. Boil 2 cups of water and turn off heat. Once the water reaches room temperature, add the dried mango slices and let it soak for an hour or till the pieces soften and water is absorbed. 5. Meanwhile, boil the strained jaggery for 8-10 mts or till it reaches one string stage [padam]. 6. Keep aside to cool for 7-8 mts. Combine red chilli pwd, methi pwd and salt [as required] to the soaked mango slices and mix well. 7. Add the jaggery syrup and combine well. 8. Heat oil in a pan, add asafoetida and fry for a few seconds till the flavor comes out and add to the mango pickle. 9. Store in an air tight bottle and refrigerate. 10.This pickle can be eaten immediately on preparation. 2. 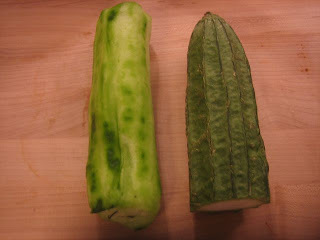 Cut the ridgegourd skin [and/or flesh if using] into small pieces and keep it aside. 3. Heat oil in a pan, fry the urad dal till it turns golden brown. 4. Add the sesame seeds, grated coconut [optional] and dry red chillies and fry for a minute. 5. Add the ridgegourd pieces, garlic cloves and tamarind and fry till it is cooked and becomes tender. Switch off the flame. 6. After this cools enough to handle, blend everything together with required salt, asaefoetida and very little water. 7. Ridgegourd chutney is ready. Serve this chutney with rice, idli and dosai. 1. Sift rava through a muslin / cheese cloth or very fine sieve. 2. Heat 1tbsp. pure ghee / unsalted butter and fry rava ,on a moderate heat, stiring constantly to light brown color and set aside. 3. Now heat 2 tbsp oil in a pan and add mustard seeds and allow them to splatter. 4. Add the daals : channa & urad & curry leaves to it and fry till they turn red. 5. Add onion, ginger and green chilies. Sauté for 2-3 minutes. 6. Add all the vegetables, turmeric & chili powder, and salt to taste. 7. Now add 4 1/2 cups of water and cover the pan and allow it simmer on low heat until the vegetables are done. 8. Add the fried rava to it stirring constantly till it becomes little thick. 9. Take off from the heat and lemon juice if desired. 10.Serve hot garnished with cashews and coriander. 1. Chop onions, chillies, ginger, tomatoes , potatoes, carrots into small pieces and keep aside. 2. Heat oil and add chana dal, urad dal, mustard seeds and curry leaves. When they start to crackle , add peanuts and cashewnuts. Fry till they turn golden brown. 3. Add potatoes, carrots and fry for 4-5 minutes. 4. Then add chillies, ginger , onions, peas and tomatoes. 5. Cook until they are done. 6. After that add salt and 8cups of water, cover with a lid and let it boil . 7. When the water comes to boil add vermecelli and simultaneously stir ( so that no lumps will be formed). 8. Cover the upma with a lid for 5-6 minutes and then add 2tbsp of ghee and stir well. 1. Clean and wash the rice flakes. Completely drain the water and keep aside. 2. Take a kadai and heat with 1 tsp of oil. Then add mustard seeds, urad dal, channa dal and curry leaves. 3. Fry till it turns golden brown colour. 4. Then add sliced onion and slitted green chillies. Fry till it turns into golden brown colour. 5. Now add the aval, turmeric powder and salt. Sprinkle with little amount of water. 6. Finally add coriander leaves and remove from the stove. 7. Add the lemon juice and coconut gratings on the finished Upma so as to decorate it. 8. Serve hot with coconut Chuney or pickle. This is a breakfast dish from the Land of Coconut Trees, famous in all the southern states too, which features the same rice flour and coconut. The soft and thin Idiyappams, in its pure white colour, when garnished with fresh grated coconut, is a real beauty to taste. Idiyappam is said to be the best, when served with sweet coconut milk. Other people may prefer to relish this dish with some spicy curries too. You could also have it with a tasty Potato Stew or vegetable Korma. It will taste yummmmy! 1. Boil water in a pan,adding required amount of salt into it. 2. Pour the boiled water little by little to the rice flour, stirring in between, until it is ready to make into a smooth dough. 3. Allow it to cool for a while.When it is half cooled, knead it with your hand into a smooth dough, adding coconut milk also if your wish to use it. 4. Lightly grease the idiyappam press and the idli mould to prevent sticking. 5. Add 1/2 a spoon of grated coconut into each idli plate. 6. Spoon some dough into the idiyappam press,close the lid and squeeze the dough onto the idli plates in a circular motion. 7. Garnish each idiyappam with a little more grated coconut. You can mix little sugar with the coconut[if you like it to be sweet],again that’s also optional. 8. Now place the idli plates in a steamer and steam it until done. 9. Allow it to cool for a while and carefully remove the idiyappams to a serving bowl. Kuzhi means hole in tamil. As we are pouring the batter in a hole, it is called as kuzhi paniyaram. It can be made either as sweet or savory. This paniyaram is from the left over idly batter. It tastes like the medu [Ulunthu] vada. Easy to prepare and tasty to eat. Loved by the entire family, especially children. 1. Soak rice and dhal separately for 5 hours. 3. Mix them together and add salt. 4. Leave it overnight to ferment. 5. Heat 2 tsp oil, add the seasonings. 6. Once mustard crackle, add chopped onion, little salt and green chillies. 7. Fry till onions are transparent. 8. Add this to the batter & mix. 10.Fill the well with 1/2 tsp oil each. 11.Pour the batter in each well till 3/4th filled. 12.Cook it on both sides in medium flame till golden brown. 13.Serve hot with coconut chutney. 1. Wash rice and dal together and drain nicely. 2. In the Rice cooker heat 1 tbsp ghee. 3. Add rice and dal. Fry till the ghee coats the mixture. 4. Add the rest of the ingredients, except Cashews. 5. Add water. Cover and cook. 6. Keep testing the water level and stir frequently as it has a tendency to stick to the bottom. 7. When rice gets fully mashed garnish with cashews. 1. Fry the rava without any oil till it is really hot to touch. 2. Fry the black pepper and cumin seeds in a teaspoon of ghee and make a coarse powder of them. 3. Fry the cashewnuts, curryleaves, chopped ginger and keep aside. 4. Pressure cook the moong dal with 1 cup of water. 5. After the pressure subsides transfer the cooked dal to a heavy bottomed pan and add a cup of water. 6. Add the required salt. 7. Allow this to boil well. 8. Add the fried rava to the above boiling (cooked) moong dhal in small measures and stir continuously till the rava is cooked completely. 9. While the rava is being cooked add the ghee little by little. 10. Finally, add the coarsely powdered pepper and jeera and the fried cashewnuts, curry leaves and chopped ginger. 11. If you want a spicy rava pongal you can also use a teaspoon of chopped green chilly. 12. This goes well with coconut chutney. Sakkarai Pongal is a very popular/tasty recipe. 1. Chop almonds and cashewnuts. 3. Pour milk in the earthen pot called 'Pongapani' and place it on fire. 4. When the milk starts boiling add rice and dal, after washing. As soon as the rice and dal are cooked to softness, add jaggery and ghee. 5. Let cook on medium fire for some time and then put in almond and cashewnut bits, saffron, nutrieg and cardamom powders. 6. Now, add the kismis. Medu Vada , is a household dish in South India. Any function is not complete without this Vada. It forms an integral part of the menu, be it a wedding or any other function. This along with pongal. coconut chutney and sambhar is a perfect combination for breakfast. It will make you so full you will not feel hungry till your dinner time......very sumptuous...!!! 1. Soak the Urad Dal for about 2 hours. 2. Drain the water and blend it in a mixer along with the green chillies and a piece of ginger till you get a smooth paste. 3. Make sure you do not add water , since the finely chopped onions will add to the water content. 4. Add the onions along with salt to the Urad Dal paste . 5. Mix well and keep aside for 5 mins. 6. Heat oil in a heavy bottomed kadai and when the Oil is hot. 7. Take portions of the mixture make flat rounds and fry them in the oil. 8. Make sure that you drop the vada very slowly and carefully so that the hot oil dont spat outside the kadai. Some may add rice flour to this mixture so that the Vadai is crispy. This will only make the vadai absorb more oil. 9. Hot vadas can be had with Coconut Chutney or sambhar. 10.This vadai is also used to make Sambhar Vada or Thayir/Dahi Vada. Both of them are very famous dishes in South Indian restaurants. 1. Dilute the buttermilk in a bowl and keep it aside.Make them into small flat vadais , while the oil is getting heated in a thick bottomed vessel/frying pan. 2. Peel the cover of the flower and pull out the flower bunches of each layer. 3. Next, remove the stamens of each flower and chop them into fine pieces. Make sure to remove a long stem inside each floret, as this is not good for health and does not digest easily, if taken. 4. Put the chopped flowers in buttermilk water along with pinch of turmeric . 5. Soak all the above said ingredients for about an hour and grind it coarsely so as to form a thick paste. 6. Drain the excess water from the chopped flowers and add it to the mixture, along with curry leaves. 5. Drop the flat-made vadais one by one and deep fry them till golden brown. Wait for the oil to strain off the vadais, in a strainer. This spicy Indian dish, make a great appetizer or snack/tiffin item. They are served with spiced yogurt. A very special treat for the whole family! 2. Blend in blender at medium speed using minimum water to keep paste moving freely. 3. Add salt, cumin, and chilies. 4. Then start heating the oil, it needs to be quite hot. Drop large spoonfuls of batter into your hand. Form in traditional "donut" shape. Fry till golden brown. 5. Drop fried Vadas in water. Let it soak 3-4 minutes or until ready to serve. 6. Beat yogurt with milk. 7. Add pepper, curry leaves, and ginger according to taste. Some people add mint or mango chutney to this as well. If you prefer it sweeter add a bit of Splenda. 8. Squeeze out water from the vada and pour spiced yogurt over the top. 9. Garnish with cilantro (coriander) leaves and some shredded carrot. 10.Makes about 12 dumplings and about 1 - 1/2 cups if sauce.